The only event at Sundance that felt like a family reunion, 2 Dope Queens Brunch, one hilarious, real, and enlightenment. HBO presented the brunch at the chic Tupelo on Main Street. The theme, "Reclaiming Your Crown” was in full effect and the queens were onsite to engage in a conversation with moderator, Angela Rye about being a dope queen in a male-dominated industry. The room was filled with pure melanin magic as guests reminisced and sipped champagne while listening to hip-hop classics! Although the discussion was rather quick, no topic was off limits. 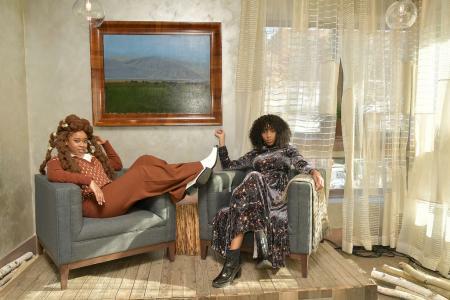 2 Dope Queens stars, Phoebe Robinson and Jessica Williams served several hilarious moments during the exclusive event and discussed everything from hair-braiding to politics. The ladies discussed politics, plans, our favorite First Lady, Michelle Obama, and simply being "booked and busy." For those that aren't aware, 2 Dope Queens is based on the WNYC Studios podcast of the same name, the four-episode HBO special aired in February of last year. The new season kicks off next month and will feature guest stars as Lupita Nyong’o, Daniel Radcliffe, Janet Mock, Keegan-Michael Key, and Lizzo. The show is equally hilarious and eye-opening and a true original way to discuss pressing topics in todays society. Although the two have decided to end their hit show after its second season, which airs on Feb.8th, these two aren't going anywhere. Phoebe has written two books You Can’t Touch My Hair (And Other Things I Still Have to Explain) and Everything’s Trash, But It’s Okay, said she hopes to start her own imprint and book club. She’s also in the upcoming comedy, alongside Taraji P. Henson, What Men Want. Jessica who was recently seen in Fantastic Beasts: The Crimes of Grindelwald (she recently gushed about how J.K. Rowling slid into her DMs asking her to play the role at an IMDb Studio discussion), also has roles in the upcoming The Twilight Zone reboot, Corporate Animals, and Booksmart. These two are definitely the epitome of booked and busy!